Ryan Blackney is a Partner in the Commercial Litigation Practice Group with a focus on trial work. Ryan is an experienced trial attorney, having tried over 200 cases, including personally handling 52 jury trials, litigating over 100 evidentiary motions. In 2017, Ryan first-chaired a week-long trial before the Bankruptcy Court in the District of Kansas, and in 2018, Ryan tried a two-week jury trial in the Northern District of Illinois. Ryan focuses his practice on complex commercial and bankruptcy litigation, and especially on commercial fraud, fraudulent transfers, and objection to discharge adversary proceedings in bankruptcy court. Ryan assists his clients in high-end asset and debt recovery work, often involving wealthy debtors intent on hiding their assets. Ryan brings his unique background in criminal prosecutions and his extensive courtroom experience to each case. Before joining Freeborn, Ryan was an Assistant State’s Attorney for eight years. From 2007 to 2011, he was a Special Prosecutor for McHenry County, Illinois. As a special prosecutor, Ryan handled the most high-profile crimes in McHenry County from indictment to verdict. Ryan is husband to Michelle, father of three, and spends his free time coaching his kids' sports. Represented a creditor in bankruptcy in pursuing a debtor that had fraudulently transferred a company to his wife to hide his assets pre-bankruptcy. The Freeborn team investigated that debtor for bankruptcy fraud and our efforts ultimately lead the debtor to voluntarily waive his discharge, and (unsuccessfully) seek dismissal of the bankruptcy action. The team was able to obtain derivative standing to pursue the fraudulent transfer claim on the trustee’s behalf, resulting in a near 100% recovery for the creditor. In April 2017, first-chaired a bankruptcy fraud trial in the District of Kansas for the client, an automotive performance company. The debtor personally guaranteed his company's debt six-figure to our client, but refused to pay or reveal his assets. After a contentious trial, the bankruptcy court found the debtor guilty of lying about his assets in his bankruptcy filings and illegally transferring assets to his son prior to the bankruptcy. The court also burst Kansas' near complete homestead exemption, resulting in a full repayment to our client. Represented a creditor, pursuing a debtor in bankruptcy court, uncovering multiple fraudulent actions by creditor, causing creditor to voluntarily waive his discharge. Represented a Tier 1 domestic automotive supplier in a lawsuit against a Tier 2 foreign supplier related to a long-term international supply contracts with major foreign car manufacturer. Served as the lead associate for a large corporation in a multiple plaintiff, multiple defendant child sexual abuse case. Worked on complex litigation spanning state courts, bankruptcy courts, and appellate courts in fraudulent transfer litigation against former members of a law firm that breach their rent guarantees. Successfully defended Board Superintendent charged with multiple Class X felonies, resulting in misdemeanor sentence with no jail term. Represents 2,500-acre vineyard and winery in Paso Robles, California in breach of fiduciary duty, unjust enrichment, and unfair competition lawsuit against its former president in a two-week jury trial. Author, "Illinois Real Estate Tax Sales Are Not Designed To Achieve Fair Market Value and thus May Be Avoided as Fraudulent Transfers", Civil Litigation Flashpoints, published by the Illinois Institute for Continuing Legal Education, March 2016. Author, "Bankruptcy Court Finds that Debtors Cannot Pay Lawyers Simply to Avoid Creditors," Civil Litigation Flashpoints, published by the Illinois Institute for Continuing Legal Education, November 2015. Author, "Room to Breathe: The Ninth Circuit Decides that a Trustee’s Avoidance Powers Preempt State Law Statutes of Repose," American Bankruptcy Institute Commercial Fraud Newsletter, June 2015. Author, "Clawbacks Stop at the Shore: The Second Circuit Limits the Extraterritorial Application of a Bankruptcy Trustee’s Avoidance Powers," American Bankruptcy Institute Committees website, December 2014. Co-author, "Fraudulent Transfers and Reasonably Equivalent Value: Shifting the Burden of Production to Defendants," American Bankruptcy Institute's Committees website, May 2014. Author, "Seventh Circuit’s Message to Fraudsters Playing Shell Games: "You’re in a Hole, Stop Digging!," Civil Litigation Flashpoints, published by the Illinois Institute for Continuing Legal Education, April 2014. Author, "Taking the Confidence from the Con Man: An Associate’s Response to Fraud." Civil Litigation Flashpoints, published by the Illinois Institute for Continuing Legal Education, May 2012. Co-presenter, Significant Issues in Fraudulent Transfer Actions: What You Need to Know in 2015 Webcast, The Knowledge Group, July 2015. 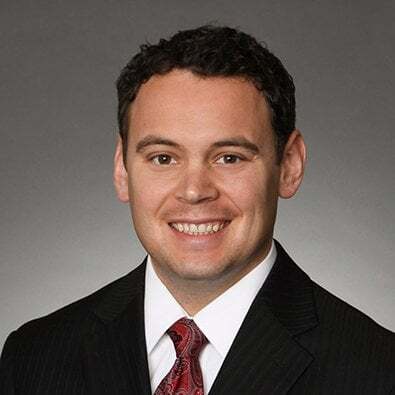 Freeborn & Peters LLP is pleased to announce that Ryan W. Blackney, an associate in the firm’s Chicago office, has been named by the Chicago Council on Global Affairs as one of its Emerging Leaders, Class of 2018. Ryan Blackney recently authored an article for the Illinois Institute for Continuing Legal Education's Flashpoints newsletter. Ryan Blackney reviews the Ninth Circuit decision in In re EPD Invest. Co. LLC as it relates to trustee avoidance powers and statues of repose. Campobasso and Blackney provided tips on how to love being an associate.